Discussion in 'Custom Filters' started by Blaz, Feb 14, 2015. 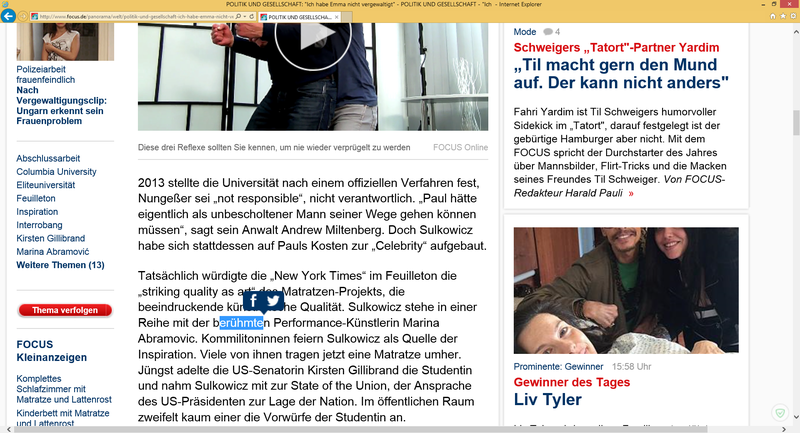 Scroll down a bit and highlight some text, in IE11 some social overlay is shown which I would like to remove. Can you tell me how to remove the "play" buttons in the text (scroll down to the phrase "Wir haben uns umarmt und angefangen, uns zu küssen." Generally and not just those two mentioned in the topic. The picture is gone, but after the link you will still see the white space of that picture. Very likely I need search & replace feature. Any script to block the link getting bigger when moving the mouse over it? I am not sure about this blocked script, maybe it's important for the site, so please check if everything works good. You will see them at the bottom of a page (if it contains more than one comment). Line "Erkältung, wenn die Nase läuft, die Krankheitserreger in den "
Could you please show the screenshot? As it is an animation I can't produce a screenshot. Ah, I see, I thought you were talking about floating "share" block. I've just tried it with these filters from my posts above and I don't see animation there anymore. Sadly it is still shown for the word "Drohne" in http://www.focus.de/politik/deutsch...ff-versenkt-beinahe-motorboot_id_4576060.html in my IE11.